You're not a typical nine to five. You need to know when people CAN work not when they cannot. SchedgeUp allows your staff to enter their own availability based on the events happening at your theatre. You can quickly see who is available (and if they are qualified for that position) within seconds. SchedgeUp allows managers to easily create the schedule by dragging available performers into open spots. You can quickly see how often someone is already performing to avoid the dreaded over (or under) scheduled performer. The system even tracks who made the last change to hold managers accountable. The system does more than just scheduling. Set up custom emails to automatically send out on birthdays. Upload this weekends' lineup to your webpage with the click of a button. Create the event templates that work best for you and your theatre. At SchedgeUp, we make the system work for you and not the other way around. Simple tools designed to help streamline your scheduling. Easily schedule team members by dragging them into an event, all while keeping track of how often they are getting scheduled. Create event templates that allow you to create events with a single click. Set the length, the location, which roles are needed, and who can see the event all in one place. Whether you want to see the full show schedule, the entire cast's availability at a glance, or shows with holes, our reports will get you the information you need. A straightforward, on the record way for managers to approve shift swaps with date and time stamps. 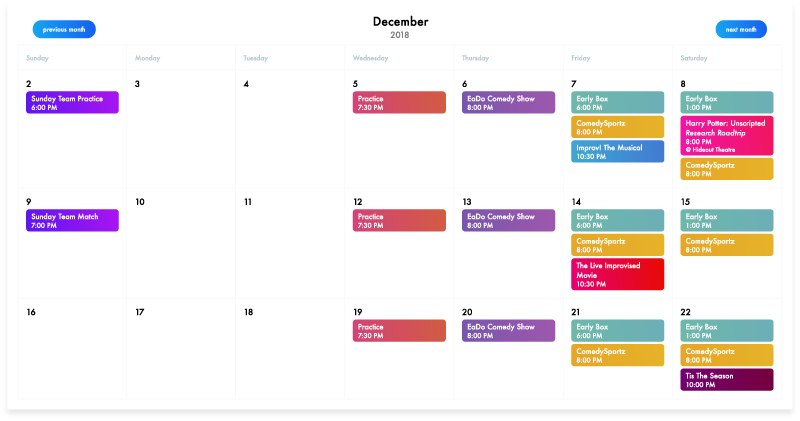 Users can view their schedule, the theatre's schedule, and shifts that need to be picked up straight from the dashboard. See an overview of users and positions they are eligible to work. When scheduling you can even see how often each user is assigned to a particular role. Use your event templates to create regularly occurring events based on a custom schedule you set. Add or remove a user from SchedgeUp and the user will no longer display on your website's team page. Keep shift exchanges in one place. Team members can request cover and pick up shifts directly from their dashboard--with manager approval! Automatically send out reminders on the day of an event to those scheduled. Automatically post the cast for your upcoming shows directly on your website. Automatically update the "team" portion of your website. Pictures, names, and all! Send custom emails to all your users based on various triggers, i.e. Event Reminders, Schedule for the Month, Birthday Announcements etc. Organize people into separate groups so users only ever see what they need to. Administrators, Managers, Team Members, and Groups allow for easy on-boarding and permissions to certain event types and the account. Create custom fields specific to your organization. These fields will populate in the team member's profile, i.e. shirt size or jersey number! Allow certain users access to whichever manager functions you like. Is your theatre part of a larger organization? Sometimes you'll want to schedule someone from another theatre and soon you'll be able to! Attach documents to events that can be accessed by your users and even attached to automatic emails that get sent out. Export reports to Excel for easy storage and creating your own calculations. Your Personal Tour Guide to SchedgeUp. With up to two hours of video time, we will help build out the system to work best for you and help develop best practices! Start scheduling even faster with our setup service. We will create your event templates, your event schedulers, and even your groups and roles. Manage multiple theatres? Contact info@schedgeup.com for group pricing.